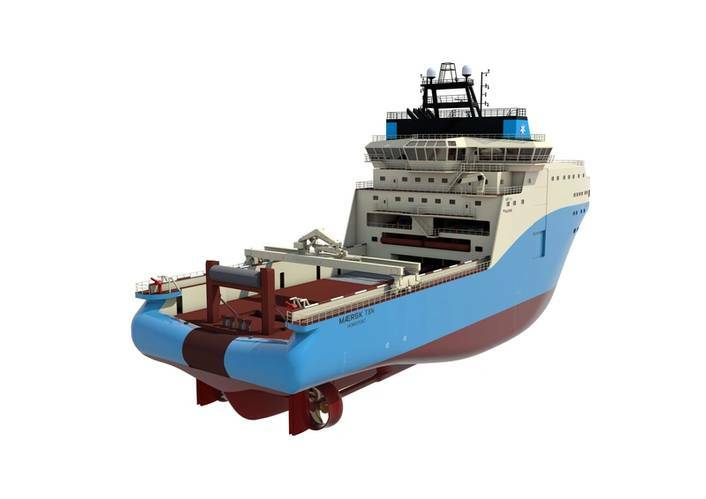 A new series of six Anchor Handling Tug Supply vessels to be built at the Kleven Verft AS in Norway for the Danish based Maersk Supply Service A/S - part of the A. P. Møller-Mærsk Group, will feature fully integrated solutions from Wärtsilä. There is an option for an additional four vessels within this series. The contract with Wärtsilä was signed in November. The 95 metre long vessels will be utilised in deep water offshore oilfield operations, with reliability, safety, and uptime specified as being priority requirements. Wärtsilä's responsibility encompasses the complete power generation solution, electrical distribution and drives system, vessel automation system and propulsion system. All these systems will be fully integrated to provide optimal power, efficiency, versatility and redundancy, while having the lowest operating expenditures (OPEX) and a minimal environmental impact. In addition, Wärtsilä will supply comprehensive project services, including project management, engineering, yard support, and commissioning. The vessels' power generation solution will be based on the latest model of the Wärtsilä 32 and Wärtsilä 20 generating set. The Electrical and Automation system is centred around Wärtsilä's proven and popular LLC (Low Loss Concept) power distribution system for electric and hybrid propulsion applications. The Wärtsilä LLC enhances energy efficiency and offers excellent redundancy with superb system availability. The Wärtsilä LLC will enable the vessels to achieve the highest possible Environmental Regularity Number (ERN) of 99.99.99.99. The ERN rating represents the capability of a vessel to maintain its position and normal operations under certain weather conditions. Wärtsilä is the first company capable of providing such a high ERN. The propulsion system includes two Wärtsilä controlled pitch propellers (CPP) and five Wärtsilä transverse thrusters. The full integration of all these Wärtsilä systems ensures optimised operational efficiency while, at the same time, providing both the owner and the yard with single supplier time and cost saving benefits. "With offshore oil and gas exploration moving to deeper waters and ever more challenging conditions, the emphasis is increasingly on efficient and reliable vessels with low operating costs and a minimal environmental footprint. These needs largely explain why Wärtsilä integrated solutions have been selected for these vessels," says Magnus Miemois, Vice President, Solutions, Wärtsilä Ship Power. "The design of these vessels, display the need to provide safe operations with reliability and efficiency. An example of this is that we have selected Wärtsilä's fully integrated, fuel efficient and flexible propulsion system to give the performance we need. This integration capability will enable good fuel economy, low emissions, and excellent station keeping. This certainly adds considerable value to the equipment package," says Head of Special Projects & Newbuilding, Director Peter Kragh Jacobsen, Maersk Supply Service A/S. The first six vessels are scheduled for delivery between the fourth quarter of 2016 and the third quarter of 2017. If the option is taken up, the additional four vessels will be delivered in the beginning of 2018.